Ana: Hi! I’m Ana and I’m 23 years old. I’m the most positive and confident person you could ever meet. Ana: I grew up thinking that relaxing my hair was the best way to avoid problems, thanks to my mother. The first time my hair was relaxed was in 1997/1998 and at that time, I was about eight years and thought I was beautiful. Before age eight, my neighbor had always braided my hair. When I moved, my mom started taking care of my hair…and messy hair was my trademark! Everything changed in January 2012! I decided that relaxing my hair was no longer worth it…it was doing so much harm to my hair. The best way to treat it well, after so many years of "maltreatment," was time to return to my natural state: amazing curly hair. In November of that year, I had my first big conversation about the transition phase with one of my curly friends, Denise, who was going through the same thing. Ana: My routine is very simple! I wash my hair about twice a week. I don’t use shampoo, so the night before I give my head a short massage with a mix of oils (coconut, black castor, and jojoba oil). This is the best way to nourish and detangle my hair! The next day I wash with conditioner (Tresemmé Naturals) and leave it in for half an hour. Then I dry my curls with an old t-shirt (to reduce frizz), and I finish with the L.O.C. method. Leave in – Giovanni, oil – Argan or Black Castor and then I use Whipped Butter Creme from Belle Amour Blends. Ana: Again, it's super simple. I usually pineapple my hair before I go to bed, and I sleep on a silk pillowcase to protect my curls. 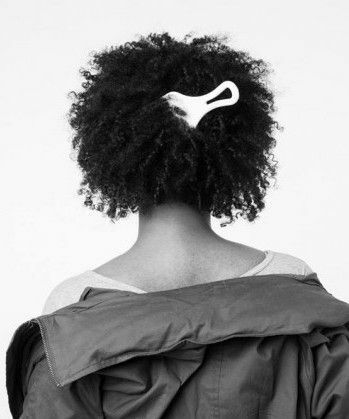 In the morning, I just shake my head (like a crazy person), refresh my curls with a homemade spray (water + oil) and when my hair is dry, I use whipped butter cream (if necessary). Throughout the day, if I feel the need to refresh again, I use the spray…I always carry a mini version in my bag! Ana: I ALWAYS wash and go! Ana: It’s very important to have a good leave-in. I really like Giovanni, Mixed Chicks and Moroccanoil Intense Curl Cream. They are my favorites so far! Tools: a good old t-shirt! Ana: The first time I colored my hair was at the hairdresser (mixture of red with pink…not sure how to explain it). After that, I started to color my hair at home. Ana: I pineapple my hair at night to keep my curls looking nice when I wake up! Ana: In general the decision was well accepted. There will always be people who prefer me with straight hair, but those opinions don’t influence me at all. I say that “in general” the decision was well received because it wasn’t accepted by my mother and I think I understand the reason. My mom has the typical Indian hair, the hair I always wanted and never had, and seeing me with my natural hair which at one time of my life I "despised" is tricky (I suppose). She will never understand, and maybe if I had her hair I wouldn’t be able to understand my daughter either. NC: Did you big chop or transition? For how long? Ana: I think in my case, it wasn’t necessary to do the big chop. I cut a few tips of my hair that were visibly damaged and that was without doubt the best decision I could have made! I have now been natural for almost two years. Ana: I love being me and having so much confidence! 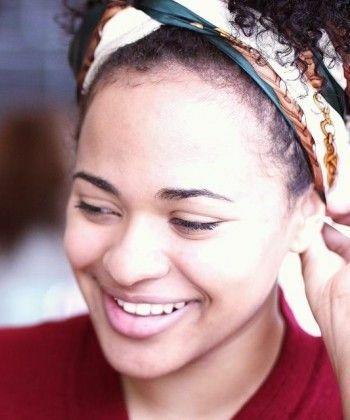 NC: How does having curly hair impact your everyday life? Ana: I think I have more of an impact than my hair does. I feel confident and of course that has a positive impact but if I'm feeling a bit sad, my hair isn't going to help me. It usually helps me feel confident, but it doesn't change my personality. I am more than my hair! Ana: Look into the mirror and say they are beautiful. Don’t take what society says to seriously. Believe in yourself…that is how you gain confidence. Love yourself girl, or nobody will (in my J.Cole voice). Ana: At this time in my life, I don’t accept anything that doesn’t make me happy. I put aside what does not interest me and try to help the lovely girls loved from Curly Essence’s family. 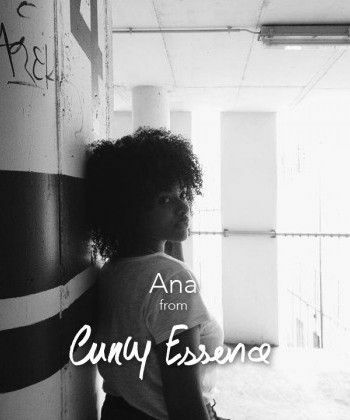 Want to know more about Ana and Curly Essence? Visit their blog to read more and to find links to their social media pages.